I am pleased to announce the appointment of Leslie S. Jones, M.D., as Chair of the Department of Ophthalmology, effective August 28, 2017. Dr. Jones has been serving Interim Chair since May, 2016. Dr. Jones is an Associate Professor in the Department and serves as the Residency Program Director and Director of Glaucoma Service in the Department of Ophthalmology. 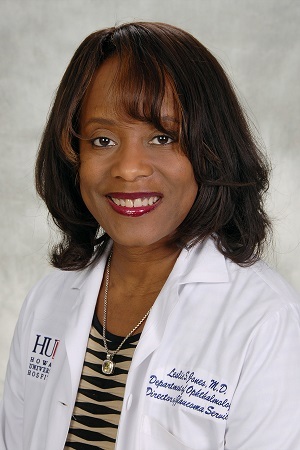 Dr. Jones completed her medical degree and residency in Ophthalmology at Howard University, followed by a fellowship in glaucoma at Wills Eye Hospital. She has demonstrated a commitment to vision research as a Howard Hughes Medical Institute fellow at the National Eye Institute, and is currently the glaucoma consultant for the Uveitis Section of the National Eye Institute. Dr. Jones is the recipient of the American Glaucoma Society Clinician Scientist Award, and is committed to patient education and early detection of glaucomatous optic neuropathy. Her research focuses on the genetic epidemiology of glaucoma, the evaluation of current and innovative glaucoma medical and surgical therapies, and use of on-line simulation as an adjunct to traditional ophthalmic clinical skills training. Dr. Jones has a strong commitment to resident education and the development of our future ophthalmologists. Dr. Jones will oversee all educational, research, clinical and administrative activities of the department and will work to enhance critical mission of the department and University. Please join me in congratulating Dr. Jones in her new role at Howard University.